Penn State is putting together one of the best recruiting classes in the nation for 2015. From the early returns, though, the Nittany Lions’ 2016 class might even be better. As Big Ten football media days were wrapping up in Chicago and new Lion coach James Franklin was all over the interview circuit, Penn State got some great news for the future when Shane Simmons, a 6-foot-4, 223-pound defensive end from DeMatha in Hyattsville, Md. 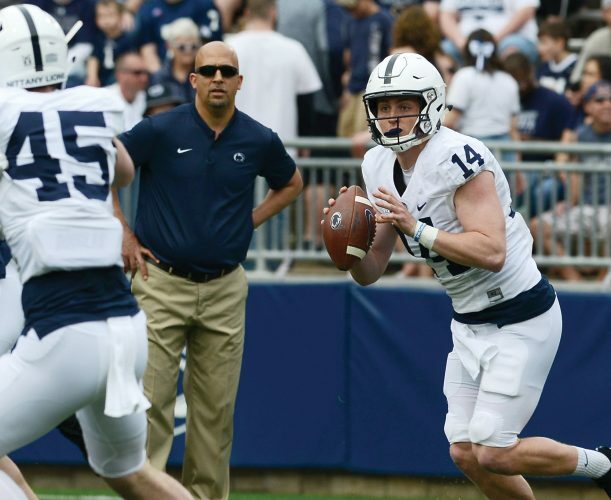 ranked in the top 30 prospects nationally by three of the four major scouting services, announced his intention to play for the Nittany Lions via webcast Wednesday afternoon. A consensus five-star recruit, Simmons already had close to 30 scholarship offers from coast-to-coast. His other four finalists were Florida State, Alabama, Ohio State and Maryland – the Seminoles were considered the favorite before Simmons took a trip to Penn State earlier this month, and it seemed the Lions were constantly gaining momentum from that point on. ESPN Big Ten recruiting analyst Tom VanHaaren was one of the moderators on the webcast. He thought the value of Simmons’ addition couldn’t be understated. ESPN rates Simmons as the 30th best player in his class. Rivals.com has Simmons ranked highest, placing him at No. 25. Finding pass rushers always is important, but elite defensive ends have become an even bigger priority with more and more college teams running spread option offenses. Van Haaren expects Simmons to bring value off the field, too. Simmons’ announcement came hot on the heels of the commitment of Woodland Hills rising junior Miles Sanders, rated as one of the top 10 running backs in the class. Following the lead of fellow D.C. area star Adam McLean, who has been working the recruiting lines hard for his 2015 class, Simmons has vowed to promote the Lions to players like rising senior offensive line teammates J.P. Urquidez and Terrance Davis, as well as Bullis quarterback Dwayne Haskins – Haskins is one of the top-rated quarterbacks in the 2016 class.